Uber is great way to generate some extra money. In fact, many drivers are now driving Uber as full time job. Although we already discussed how to Maximize Uber Earning in Toronto. In this section we will explain 7 ways that Uber drivers increase earning and make more money in Toronto. Since Uber is now fully legal in Toronto, and providing rideshare insurance while you are on trip. It is attracting many people to join Uber as driver and give a try. If you are thinking to join Uber or have decided to join follow the following tips to generate more income and better earning. Full Time Drivers in Toronto are making $1000 to $1500 weekly. Depending on vehicle and Uber Services Level. You can make huge bonus amount through your referral code. Uber drivers increase earning with Uber Driver Signup Bonus Toronto. Before there was fixed bonus amount if you sign up with referral code. It was $50 for bonus for new applicant and $300 for referrer. Currently Uber is offering $400 Guaranteed Earning, and $400 for referrer, when you sign up with referral code. Therefore, by using the referral code your earning will be guaranteed. If you sign up with driver referral code in Toronto GTA, Uber will make sure you will make $400 in first 50 trips. If not they will pay you they difference. For example, you made only $300 in your first 50 trips within 90 days, so you will get $100 bonus from Uber and so on. Uber Driver $400 Guaranteed Earning & $400 Referrer! Most of time Uber offers guaranteed surge promotion in Toronto. That usually happens during busy time of year or special events. Some of promotions are ongoing, while others seasonal. Driver must take advantage of these promotions and can boost their income. Guaranteed Surge is when Uber want to encourage the drivers to hit the road and make extra money. For instance, Uber offer 1.5 x surges in downtown from 6 am to 9am. So your $10 trip will be 10×1.5= $15. If the surge price is higher than the guaranteed surge you will always get higher surge rate. Uber send you notification time by time for promotions, you may also check in Uber app Earning-Promotions for upcoming or existing promotions. Tipping an Uber driver is optional; adding tip through Uber app is available in US and Canada. Although Uber used to discourage tips but driver do get tips in Toronto. Thanks to Torontonian! You may often get tips in cash by the rider or they can add in the Uber app when they feel amazing customer experience. Gas-Fuel is the main expense for Uber driver. Correspondingly, time also play important role in overall earning process. Driving around in order to get ride or just keep driving in attempt to get ride is not a reliable practice. You may stick to center area, may pull over and if weather is pleasant turn the engine off. Similarly, don’t drive too far just to get surge price. Because often by the time you reach there the surge will be gone. It is frequently happens to Uber drivers when they leave their spot to chase surge price; by the time they reach there the surge is over and the spot the left is start surge. No doubt the surge is great way to get extra money. Sometimes you get ride 7 to 10 km away to pick up, you may cancel that request. Ultimately, if you stick locally in your area you may save drive time, save on gas and wear and tear. Since Lyft is officially launched in Toronto GTA. It is same like an Uber rideshare. You may also drive Lyft in Toronto at the same time. It will cut down the wait times, eventually will allow you to make more money. For instance, if Uber have no promotion going on and Lyft is offering streak bonus, power zones and prime time then better to drive with Lyft. If you are Uber driver in Toronto and didn’t sign-up to Lyft yet, you might get $500 Lyft sign-up bonus. 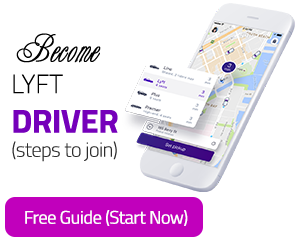 To start you application read steps to become lyft driver in Toronto. Destination mode is great feature in Uber app. You can set your destination in the app; you will only get trips going near to your destination or on the route of your destination. Uber will also make sure that pickup location is not too far. You could use destination mode if you are heading somewhere in morning commute. Especially weekend’s nights instead of end up far away from your home, it is best practice to use destination mode, on your way back from Downtown Toronto to your home. The best practice is to go into destination mode 1 hour before you plan to end you shift. Sometime you will get long trip all the way back to your destination and sometimes small trips that will bring you closer to your destination.